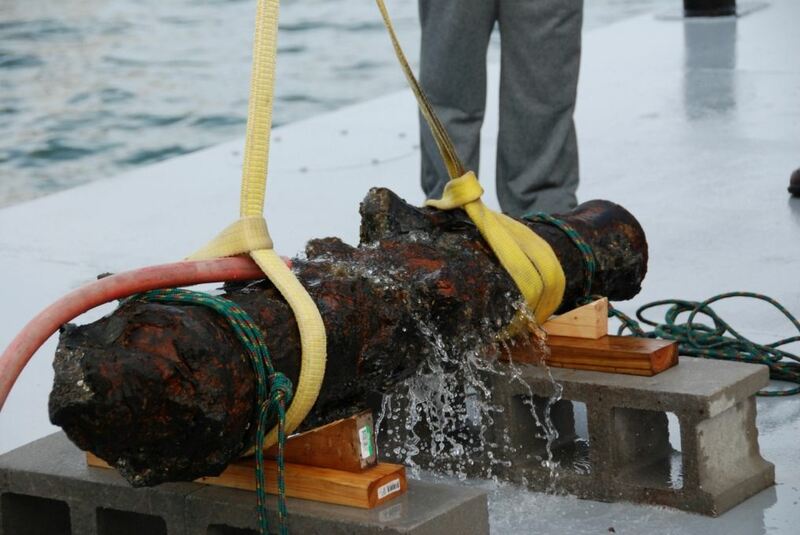 North Carolina state archaeological crews have recovered a 23rd cannon from the shipwreck of the pirate Blackbeard's flagship, the Queen Anne's Revenge. It will be featured in the QAR Conservation Lab's public open house Nov. 15. Queen Anne's Revenge (http://www.qaronline.org/) wreck site will be one of the stars of the free Open House at the Queen Anne's Revenge Conservation Lab in Greenville Nov. 15, 11 a.m.-3 p.m. The 4-foot-cannon and other artifacts recovered during the Oct. 6-27 expedition will be displayed. It's an ideal opportunity for those fascinated by pirates, archaeology and interested in conservation to see real artifacts. The open house will allow visitors of all ages to learn about recovery and conservation of Blackbeard's cannons, and even take a picture with the cannon most recently recovered. Guests can look through a microscope at the smallest objects recovered over the years and see mysteries revealed in x-rays. No registration is required to attend the event. Archaeologists with the Underwater Archaeology Branch (UAB) in the N.C. Department of Cultural Resources executed the fall excavation at the wreck site of Blackbeard's flagship, Queen Anne's Revenge (QAR), near Beaufort. In addition to the cannon, they recovered nine cannonballs, bar shot halves, an iron bolt and a grenade. Among researchers on the excavation was Conservator Kimberly Kenyon, who recorded and tagged each artifact as it was reclaimed from the sea. The cannon was an expected recovery, but the grenade was not. "We knew cannonballs were attached to the cannon, but the grenade was something of a surprise," Kenyon observes. "It's hollow in the center and would have been filled with gunpowder. Now we have recovered seven grenades and 23 cannons. We brought them all to the conservation lab for treatment." Kenyon and UAB Archaeologist/Conservator Nathan Henry did much of the work to prepare the cannon for lifting. The initial plan had been to recover two cannons, but weather conditions and the difficulty of separating the two cannons prevented that. The team was working on one complex mass at the site composed of four cannons and an anchor held together by a coating of sand, marine life and shells called concretion. Another surprise awaited the team. When the recovered cannon was lifted, an additional small cannon was discovered under the one left behind. Historical records indicate that Blackbeard equipped the QAR with 40 guns, so additional cannons not yet mapped may be discovered. Donations to help the project and research can be made to the Friends of Queen Anne's Revenge (http://www.friendsofqar.org/). Archaeologists and historians with the N.C. Department of Cultural Resources have led recovery efforts at the shipwreck site since 1997. Cannons, platters, medical and scientific instruments used by 18th-century pirates have rested on the floor of the Atlantic since 1718. Tens of thousands of artifacts have been recovered. The Queen Anne's Revenge ran aground in Beaufort in June 1718. Intersal, Inc., a private research firm, discovered the site believed to be Queen Anne's Revenge Nov. 21, 1996. QAR was located near Beaufort Inlet, N.C., by Intersal's director of operations, Mike Daniel, who used historical research provided by Intersal's president, Phil Masters. Daniel now heads up Maritime Research Institute, the nonprofit corporation formed to work on the project in cooperation with state archaeologists and historians of the N.C. Department of Cultural Resources’ Division of Archives and History. For additional information, please call (252) 744-6721. The Queen Anne's Revenge Shipwreck Project is within the Office of State Archaeology in the N.C. Department of Cultural Resources. The N.C. Department of Cultural Resources (NCDCR) is the state agency with a vision to be the leader in using the state's cultural resources to build the social, cultural and economic future of North Carolina. Led by Secretary Susan W. Kluttz, NCDCR's mission is to enrich lives and communities by creating opportunities to experience excellence in the arts, history and libraries in North Carolina that will spark creativity, stimulate learning, preserve the state's history and promote the creative economy. NCDCR was the first state organization in the nation to include all agencies for arts and culture under one umbrella. Through arts efforts led by the N.C. Arts Council, the N.C. Symphony and the N.C. Museum of Art, NCDCR offers the opportunity for enriching arts education for young and old alike and spurring the economic stimulus engine for our state's communities. NCDCR's Divisions of State Archives, Historical Resources, State Historic Sites and State History Museums preserve, document and interpret North Carolina's rich cultural heritage to offer experiences of learning and reflection. NCDCR's State Library of North Carolina is the principal library of state government and builds the capacity of all libraries in our state to develop and to offer access to educational resources through traditional and online collections including genealogy and resources for people who are blind and have physical disabilities. NCDCR annually serves more than 19 million people through its 27 historic sites, seven history museums, two art museums, the nation's first state-supported Symphony Orchestra, the State Library, the N.C. Arts Council and the State Archives. NCDCR champions our state's creative industry that accounts for more than 300,000 jobs and generates nearly $18.5 billion in revenues. For more information, please call (919) 807-7300 or visit www.ncdcr.gov.